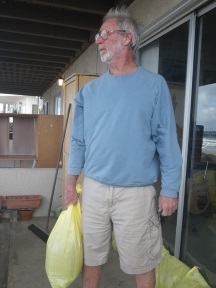 Many IB Residents got Prepared for Today's High Tides & High Surf that were Predicted by Filling up Free Sandbags from the IB Fire Department and Placing in front of Homes. is between 8 and 9 AM. 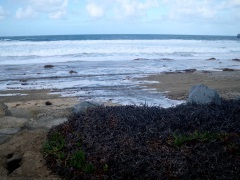 It's 5 AM now and dark, but the waves sound like they've gotten smaller, or perhaps it's just wishful thinking. I've done all I could to protect us and our belongings. 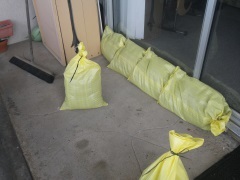 Yesterday I went to IBFD with neighbour, Alex and we filled 10 sand bags each. I put them at our front doors, then moved all the important things up on dressers and cabinets. Here are my pics from then. I never had the time to send them when it might have mattered. If we get more reports from David as the day goes on we will post them here. 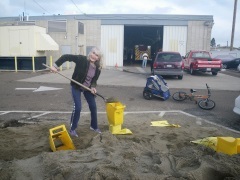 If you become in need of sandbags to protect your home, they can be gotten at the Imperial Beach Fire Department. 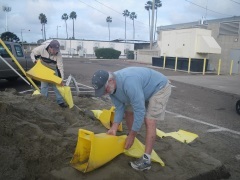 The IBFD is located at: 865 Imperial Beach Blvd, Imperial Beach, Ca 91932 and their phone # is (619) 423-8223. At the very bottom of the page is the Surf broadcast by Surfline at 1:20pm today.